Izumida et al. evaluate the economic damages as very high due to induced demand at the national level particularly when the government subsidizes for medical services and medicines. McGuire states that the hypothesis of induced demand covers a cost equal as 6.5% of the payments to physicians. The findings of Keyvanara's study on the challenges occurring for patients indicate that patients' concerns without a real reason create a kind of social damage for them which can reduce their life quality. When the demand for services increases, as a consequence, costs increase, which finally the financial costs will be burdened on people and the contribution paid out of pockets will enhances. Even, it is possible that this issue would be continued to the level of crippling costs and draw patients below the poverty line. One of the intangible costs, which patients should pay is the waste of their time and precious lives in unnecessary services. Tussing and Wojtowycz concluded that induced demand has important consequences for patients' economic welfare. Dranove and Wehner indicated that physicians induce demands by suggesting the services incompatible with the objective of patients' cost-profit. As a result, the present study is to investigate the factors affecting physicians' behaviors in induced demand using the ideas of the experts in the Isfahan University of Medical Sciences. This qualitative research was performed in 2013 through deep interview. Participants were faculty members, doctors, hospital authorities, insurance managers, and researchers in the field of health economics with executive and management experience in the health system and familiar with induced demand. These people had several years of management experience in insurance companies, income and management section of hospitals, and vice president of health care supervision. The method of sampling was purposive. In other words, the interviewees were informed people with enough experience in this regard. Sample size fitted to the data saturation. Accordingly, 17 in-person interviews were conducted, recorded and written on article. The time of the interviews varied between 30 and 90 min. For the validity of the research, the researcher conducted several interviews on a trial basis in advance, with the use of the advice, experience and assistance of the supervisors and the advisors. Then, for the data reliability, the veracity of the first interviews was considered by the supervisors and the advisors. When the revisions finished, the researcher began the work. For increasing the reliability, the data was extracted and referred to some participants and their viewpoint was considered. The criteria such as "data reliability, "assurance," and "stability" were also considered. Morality was also considered through gaining the interviewees' satisfaction. They were also informed that interviews are being recorded for the purpose of easy transcribing. Anonymity of the interviewees was preserved, and the participants were assured that the information is confidential. The method of the analysis of the data is based on thematic analysis. Data analysis stages included extraction of data, writing them on article, storing them in the computer, immersion in the data, coding, reflexive remarks, marginal remarks, memoing, and developing preposition. In the first stage after each interview, the text was transcribed, then, typed and stored on a computer immediately. In the next stage, the interview texts were examined and reviewed several times so that the researchers dominated the data. In the third stage, the data was categorized into semantic units (code) in the form of sentences and paragraphs related to the main meaning. Semantic units were also reviewed several times. Then, an appropriate code was written down for each semantic unit. In a way that in each interview, sub-themes were separated, and then integrated, and reduced. At last, the main themes were recognized. Reflective and marginal rein fact, ideas and viewpoints emerging in the researcher's mind was recorded during the interview and analysis. These signs related the notes to the other parts of the data. In the present qualitative research, 41 sub-themes and three main themes were obtained [Figure 1]. These three main themes included structural factors, factors due to statuses and behaviors and economic factors. Regarding the participants' ideas, physicians have roles in induced demands, and sometimes they are referred to as the first stimuli induce demand. For example, a participant states regarding physicians' role in the induction of drug demand: "But physicians in their therapies induce drugs more than any other issues. 60-70% of the prescriptions for patients are unnecessary; in fact, those patients do not need medicine! Or they will improve with very simple drugs" (interview no. 12)! Physicians say, "I recognized this need and I prescribed so. So, the system and structure allows him to do so" (interview no. 2). "Even a lot of clinics … if a physician does not prescribe a lot of serum, medicine and ampoules, reject that physician" (interview no. 3). "If physicians had assurance, they never would have done so … now a physicians has educated for 12 years to hold a diploma and then 7 years to be a physician, then he has passed his project, done military services, now he is 30-year-old. Now, he is going to start his life …" (interview no. 3). "When a physician is asked, for example, to visit these 100 patients in just 6 h, then he has not enough time and because he cannot examine them appropriately, he creates induced demand for them" (interview no. 11). "A patient with an insurance ID has to pay 13,000 tomans to specialist physicians for being visited, and with free insurance, he should pay 15,000 tomans! They complain that whether with insurance or without insurance, there is no difference for some physicians" (interview no. 11). In this regard, participants pointed out factors such as "physicians' authority in patients' compliance, competitions among physicians, the lack of a comprehensive medical examination, physicians' customer focus, physicians' insufficient knowledge and skill, regulative and legal affairs, and ethical factors." Participants declared that "when a physician is considered as an authority and specialty, so surely he is considered as a leverage or power source and this source causes the creation of demands" (interview no. 4). "Another issue is that there is completion among physicians themselves in attracting patients, in attracting patients' satisfaction" (interview no. 3). "A problem in our medical society is that the diagnosis is not correct! Physicians should listen to patients' accounts, physically examine them, control their medical tests, and propose differential diagnosis. At last, they should report the final diagnosis. These are not defined in our medical system at all" (interview no. 7)! "Another form is that physicians who have become well-known to some extent, and the number of their patients is large, do not examine patients at all" (interview no. 3). "Our medical groups do not enough time to explain all things to patients. They instead of sitting and speaking with patients and explaining to them, immediately prescribe them some medicines" (interview no. 15)! "It is possible that with a simple examination, a physician diagnoses whether it is foot fracture or not! However, he advises the patient to have a computed tomography scan" (interview no. 8 and 9)! Regarding physicians' customer focus, participants pointed out the following issues: "Stimulating patients' preferences and attracting and maintaining patients." They state that "one of its reasons is that I am a physician who applies induced demand, for example, to you to attract patients. The issue that other physicians have not, I think, done" (interview no. 11). "It means that physicians prescribe more medical tests, and advise patients to visit them tomorrow and a day after tomorrow and so on, they want to increase the number of their visits and prescriptions, they want to attract patients by any means" (interview no. 4). Physicians' insufficient knowledge and skills are one of the sub-themes of the reasons due to statuses and behaviors. Sometimes, physicians, due to failure to diagnose diseases, consciously or unconsciously, send patients to use services in which induced demand is unavoidable. Participants state "physicians do not diagnose disease sometimes, and they cannot explain this issue to patients, so they advise patients to perform some medical tests. It means that they send patients for something else" (interview no. 6). "Because they do not have sufficient knowledge and skills for diagnosis" (interview no. 4). "A lot of physicians have a good relationship, but this information is not applied" (interview no. 8 and 9). According to participants, regulative and legal affairs include factors related to physicians' regulations and performances. In this section, participants proposed the following sub-themes: "Physicians' fear of regulatory authorities and patients' complaints and putting off patients to evade from possible errors." "Physicians know that the case is a simple torsion which can be treated by simple bandage, but due to increasing the rate of complaints, they prescribe so" (interview no. 11). Participants presented ethical factors affecting induced demand by physicians in the form of following issues "physicians' easy goingness, being far from work conscience and commitment and physicians' lack of commitment to their real missions." "Another challenge is that physicians are not to pursue experimental work! They have become easygoing; they say as far as these technologies and facilities are available, why they run themselves into trouble" (interview no. 8 and 9)! "Some part of it is related to failure to fulfill job conscience" (interview no. 14). Participants proposed economic factors encouraging physicians in the form of following sub-themes: "Physicians' tendency to maximize profits, earning more money, physicians' economic problems, compensating physicians' infringed rights, workflow of offices, improper dependency of physicians and other health services providers." By referring to the economic origin of inducing demand, a participant states: "See, the main factor of everything in a society refers to economy, the issue of money! The person who produces things like as such and advertises or induces them, his resource is money" (interview no. 10). "Physicians like to maximize their profits, that is, their objective is profit maximization" (interview no. 2). "Sometime the reason is that they think that it is their rights, that is, their rights are infringed somewhere and for compensating them, they use this method" (interview no. 2). "A physician wants his office to be prospered, which economic aspect is one of its issues, if there is extra activities, it is because of attracting patients to visit the same office for the next times" (interview no. 12). "As there is a kind of relationship among paraclinical institutes, it is possible that there is the relationship between pharmacies and physicians" (interview no. 12). "A relationship which is assumed to be unsound. There are companies that provide equipment and prepare them, and physicians can make the relationship with them" (interview no. 5). "Sometimes, there is a relationship between the providers of services and that section that provides paraclinical activities, say, laboratories or radiology. It is again observed that unnecessary graphs and medical tests for patients are prescribed by physicians" (interview no. 13). "Some incentives are provided which explicitly encourage physicians to send patients to specific laboratory" (interview no. 2). "They are financial partners. This causes that physicians induce some demands to patients. So, because physicians are shareholders, they induce patients some demands" (interview no. 11). A part of the factors related to physicians in induced demand is structural factors. Systematically, there is no appropriate supervision on medical indications. As a result, physicians are free in providing different services. Another factor obtained from the study is physicians' insecurities in the first stages of their professional lives; insecurities such as the length of physicians' education, legal procedures such as military service and passing their projects causes that physicians perform induced demand to compensate and limit these insecurities. Another reason is due to the organization in which they work, if this organization receives a large number of patients beyond its capacity and capability, physicians may unconsciously perform induced demand to get rid of patients. The relationship between physicians and patients has an important role in induced demand which in case of its being inappropriateness, more induced demand will occur, in this relationship, if physicians' reexaminations do not enjoy required comprehensiveness, a large part of patients' problems may remain invisible and at last improper services may be provided for patients. Sometimes, physicians do not allocate enough and standard time for examining patients, which may be due to the high volume of visitors. Accordingly, physicians are not justified regarding the real problem and may suffice to prescribe some medicines and finally, the occurrence of induced demand is highly expected. The results of the present study provided a comprehensive image of the reasons affecting physicians' behaviors in occurring induced demand. The most obvious findings of the research included structural factors, factors due to statuses and behaviors and economic factors. The findings of the research showed that physicians are considered as the first stimuli of induced demand who manage active patients' demands. In the domain of structural factors; improper supervision of medical indications, expectations of physicians to activate other medical sections, physicians' insecurities in the first stages of their professional lives, maintaining physicians' faces, reception of a large number of patients beyond its physicians' capacities and capabilities, physicians' independency of insurance contracts, the reluctance of physicians to provide proper service to patients in the public sector affect the occurrence of induced demand. in the domain of factors due to statuses and behaviors, physicians' authority in patients' compliance, competition among physicians, the lack of a comprehensive examination, physicians' customer focus physicians' insufficient knowledge and skills, lack of commitment to ethics may provide the grounds for occurring induced demand; and in the domain of economic factors; physician's tendency to maximizing profits, earning more profits, workflow of medical offices, improper dependency of physicians and other health services providers, physicians' improper relationship with institutes, and incentives and commissions for encouraging physicians for financial partnership with other institutes are considered the main factors of occurring induced demand. More research on this field can contribute to quantitative investigation of physicians' roles in occurring induced demand separated by healthcare services. It is suggested that to control induced demand, strategies such as medical ethics, observing the process of diagnosing diseases from simple to complicated measures, investigating patients' real needs for referring to specialists, allocating enough time for examining patients, the up datedness of physicians' knowledge and supervising physicians' relationships with other health-related institutes should be employed. Thanks go to those who contributed in this research. Noguchi H, Shimizutani S. Supplier-Induced Demand in Japan's At-home Care Industry: Evidence from Micro-level Survey on Care Receivers. ESRI Discussion Paper Series. Economic and Social Research Institute; 2005. Pauly MV. Doctors and their Workshops: Economic Model of Physician Behavior. Chicago: University Chicago Press; 1980. Keyvanara M, Karimi S, Khorasani E, Jazi MJ. Experts' perceptions of the concept of induced demand in healthcare: A qualitative study in Isfahan, Iran. J Educ Health Promot 2014;3:27. Andersen LB, Serritzlew S. Type of Services and Supplier-Induced Demand for Primary Physicians in Denmark Danish Public Choice Workshop; København: Department of Political Science and Government; 2007. Hansen BB, Sørensen TH, Bech M. Variation in Utilization of Health Care Services in General Practice in Denmark. University of Southern Denmark, Institute of Public Health - Health Economics; 2008. Evans RG. Supplier-induced demand: Some empirical evidence and implications. In: Perlman M, editor. The Economics of Health and Medical Care. London: Macmillan; 1974. Bickerdyke L, Dolamore R, Monday L, Preston R. Supplier-Induced Demand for Medical Services. Canberra; 2002. Noguchi H, Shimizutani S, Masuda Y. Physician-Induced Demand for Treatments for Heart Attack Patients in Japan: Evidence from the Tokai Acute Myocardial Study (TAMIS). ESRI Discussion Paper Series. Economic and Social Research Institute; 2005. Abdoli G, Varhami V. The role of asymmetric information in induce demand: A case study in medical services. Health Manag 2010;13:37-42. Fabbri D, Monfardini C. Demand Induction With a Discrete Distribution of Patients. Dept. of Economics, University of Bologna; 2001. McGuire TG. Physician agency. In: Culyer AJ, Newhouse JP, editors. Handbook of Health Economics. Amsterdam: Elsevier; 2000. Shigeoka H, Fushimi K. Supply induced demand in newborn treatment: Evidence from Japan. Am Econ J Econ Policy 2011;1:17. Broomberg J, Price MR. The impact of the fee-for-service reimbursement system on the utilisation of health services. Part I. 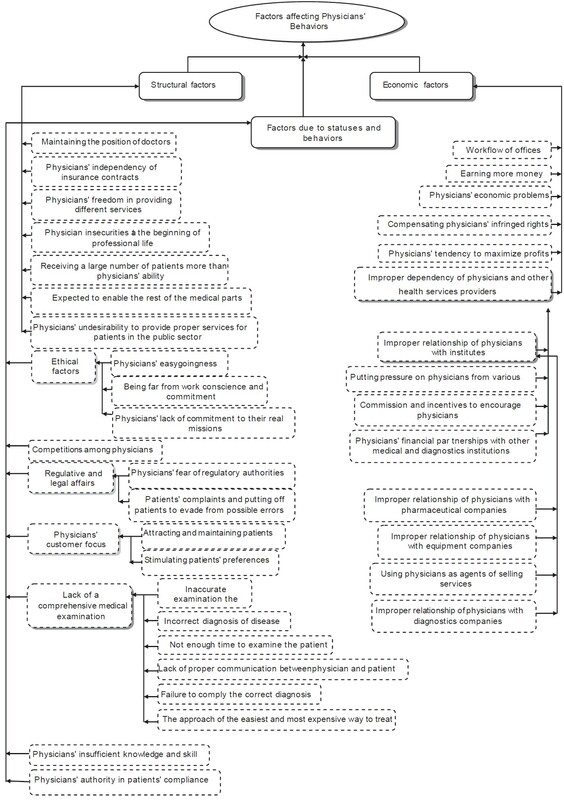 A review of the determinants of doctors' practice patterns. S Afr Med J 1990;78:130-2. Andrade Ede O, Andrade EN, Gallo JH. Case study of supply induced demand: The case of provision of imaging scans (computed tomography and magnetic resonance) at Unimed-Manaus. Rev Assoc Med Bras 2011;57:138-43. Izumida N, Urushi H, Nakanishl S. An empirical study of the physician-induced demand hypothesis: The cost function approach to medical expenditure of the elderly in Japan. Rev Popul Soc Pol 1999; 8:11-25. Keyvanara M, Karimi S, Khorasani E, Jazi MJ. Experts' perspectives on barriers due to induced demand in health services. Int J Health Syst Disaster Manag 2014;2:78-83. Saul S. Profit and questions as doctors offer prostate cancer therapy. N Y Times Web 2006;A1, C7. Tussing AD, Wojtowycz MA. Physician-induced demand by Irish GPs. Soc Sci Med 1986;23:851-60. Dranove D, Wehner P. Physician-induced demand for childbirths. J Health Econ 1994;13:61-73. Amporfu E. Private hospital accreditation and inducement of care under the ghanaian national insurance scheme. Health Econ Rev 2011;1:13. Ferguson BS. Isseus in the Demand for Medical Care: Can Consumers and Doctors be Trusted to Make the Right Choices? Halifax, Nova Scotia: Atlantic Institute for Market Studies; 2002. Madden D, Nolan A, Nolan B. GP reimbursement and visiting behaviour in Ireland. Health Econ 2005;14:1047-60. Palesh M, Tishelman C, Fredrikson S, Jamshidi H, Tomson G, Emami A. "We noticed that suddenly the country has become full of MRI". Policy makers' views on diffusion and use of health technologies in Iran. Health Res Policy Syst 2010;8:9. Keyvanara M, Karimi S, Khorasani E, Jafarian Jazi M. Opinions of health system experts about main causes of induced demand: A qualitative study. Hakim Res J 2014;16:317-28. Giuffrida A, Gravelle H. Inducing or restraining demand: The market for night visits in primary care. J Health Econ 2001;20:755-79. Fabbri D. Supplier induced demand and competitive constraints in a fixed-price environment. Bologna: Department of Economics, University of Bologna; 2001. Hasaart F. Incentives in the Diagnosis Treatment Combination Payment System for Specialist Medical Care. Maastricht: Datawyse, Maastricht University Press; 2011. Grytten J, Sørensen R. Type of contract and supplier-induced demand for primary physicians in Norway. J Health Econ 2001;20:379-93. Danzon PM, Manning WG Jr, Marquis MS. Factors affecting laboratory test use and prices. Health Care Financ Rev 1984;5:23-32. De Jaegher K, Jegers M. A model of physician behaviour with demand inducement. J Health Econ 2000;19:231-58. Dosoretz AM. Rerforming Medicare IMRT (Intensity Modulated Radiation Therapy) Reimbursement Rates: A Study Investigating Increasing IMRT Utilization Rates and Doctors' Incentives TUFTS University; 2011. Ferguson B. Physician Supply Behaviour and Supplier-Induced Demand. Queen's University University of Ottawa Economic Projects: Project on the Cost Effectiveness of the Canadian Health Care System Working Paper 94-08, University of Ottawa, Health Sciences; 1994. Labelle R, Stoddart G, Rice T. A re-examination of the meaning and importance of supplier-induced demand. J Health Econ 1994;13:347-68. Crane TS. The problem of physician self-referral under the Medicare and Medicaid antikickback statute. The Hanlester Network case and the safe harbor regulation. JAMA 1992;268:85-91. Hillman BJ, Olson GT, Griffith PE, Sunshine JH, Joseph CA, Kennedy SD, et al. Physicians' utilization and charges for outpatient diagnostic imaging in a Medicare population. JAMA 1992;268:2050-4. Mitchell JM, Scott E. New evidence of the prevalence and scope of physician joint ventures. JAMA 1992;268:80-4.